Framgia Vietnam Co., Ltd recruited several Bangladeshi IT graduates in two batches recently through DJIT for their Bangladesh office. Good news is that this company is interested in recruiting some more IT graduates for the Bangladesh Office. Therefore, Daffodil Japan IT is going to organize another written test on August 21, 2015. 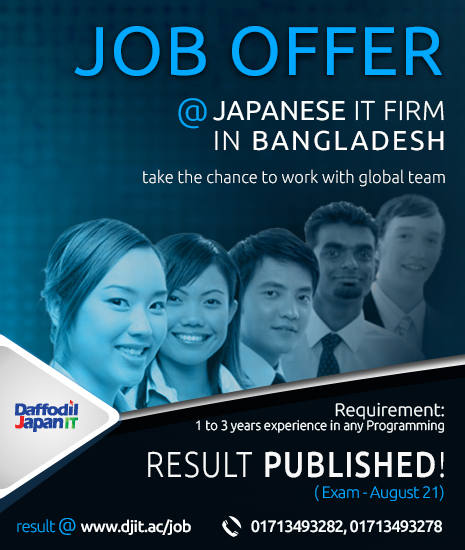 Daffodil Japan IT Ltd. (DJIT) is a joint venture organization between Daffodil Group and Bangla Business Partners Japan (BBPJ).We are expecting a large number of IT graduates for this exciting Job offer. Job offer in Bangladesh for F V Corp. Ltd. The Japanese company named Framgia (FV Corp. Ltd), Established in 2012, Head office: Hanoi, Vietnam, now the total 273 employees working here and theCore Business of the company is to provide wide range solution as offshoring services to high growth potential venture companies. They have strong platform on software Development, agile development and Ruby on Rails. Experience required : 1-3 Years development experience in any programming language. ** Company will provide the training for the selected candidates. Academic Requirements : CSE Graduate from reputed University. Job Location : Framgia (F V Corp. Ltd.) Bangladesh Office. Stage-1 : Online Resume Submission deadline on 19th August, 2015. Stage-3 : Interview Date with Japanese Company will be announced later. Apply Instruction : Candidates has to submit their updated resume with all project details.